We are all one of two different kinds of people. We are either living for self and our own desires in the world, or we are dying to self and the frailty of our flesh with the power of the Spirit through Jesus Christ. The Bible is loaded with many scriptures and sections talking about living in the world. While we all live in the world, Jesus calls us to be different than the world. Let’s take a look at some truth in the Word about living in the world. 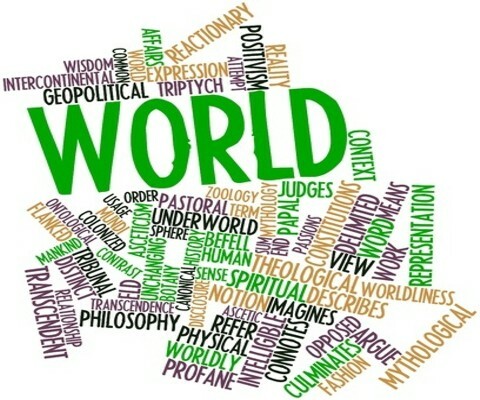 What Does Worldliness Look Like? Worldliness is simply putting your attention on yourself and the desires of the flesh that you crave. Sexual temptation is rampant and it is easy for someone who is weak to want those desires fulfilled. If putting another “notch on your belt” makes you feel like a man, you are living for the world. How about material possessions? Is the vehicle you drive practical for your family? Are you single with no kids but drive a Hummer or SUV with 3rd row seating? What I’m saying is that if getting into that Hummer makes you feel good about yourself, you may be living for yourself. Now I could be wrong. If you were intentional with the purchase of the Hummer to help drive people to and from school, church, work or other places than that is awesome! But if you just want to look cool then you are living for your own desires. If you believe in Christ than you know that living for Jesus is a journey. You don’t become perfect overnight or ever. You will stumble along the way, but the emphasis is on putting forth effort to transform your mind by thinking differently. When you were living for yourself, you did lots of selfish things. Jesus calls us to be unselfish and to help others. In fact, “He said to him (a Pharisee lawyer) you shall love the Lord your God with all your heart and with all your soul and with all your mind. This is the great and first commandment. And a second is like it: You shall love your neighbor as yourself.” (Matthew 22:37-39) You see, you have to die to your own desires in order to stop being of the world. You have to show love to those around you and help them instead of helping yourself. The more you put to death your own desires of the flesh, the more you will also start living to help out others and show them love. Remember the song “Cat’s In The Cradle”? The message of that song is powerful! The dad ignored his son growing up because he was only focused on himself. He missed out on one of the best joys in life, being a daddy. When the father is older he wants to spend time with his son, but his son turned out to be just like his father and pursued his own desires and ignored his dad. Which treasure are you building up? Are you building eternal treasure in Heaven or earthly treasure for your own desires here on earth? A time will come when you will die and all of those earthly possessions will mean absolutely nothing. If you have never accepted Christ I encourage you to do it right now! There is not a better time than right now! If you already believe, may God bless you as you continue to live a life worthy of the calling! Something else that might interest you: Should Christians Have Non Christian Friends? Fantastic article, it really hit me.